Mikkel Kessler, who won versions of the super middleweight world title four times, participated in some of the biggest fights in the history of the 168-pound weight class and became perhaps the greatest fighter in the history of Denmark, has announced his retirement from boxing. Kessler had not fought since losing a unanimous decision to England's Carl Froch in a super middleweight unification rematch in London in May 2013 and announced last May that he intended to end his long layoff and return to the ring. But he had not fought since that declaration because he said he could not get the fights that motivated him. Still unable to secure a fight meaningful enough to him, Kessler, known as "The Viking Warrior," elected to retire. "I have thought long and hard over the options, which have been made available, but none of these options are enough to get me motivated," Kessler wrote on his Facebook page on Saturday. "My promoter (Sauerland Event) has done a great job in creating these, but unfortunately the opportunities in the division are currently limited. I said at the time when I would fight on that I would need the right fights to motivate me. This is not a question of money. In fact these offers have been for great purses, but it is about motivation. After all if you aren't going all the way, why go at all? "I need big events to make me train to get me to the standard that I have been used to presenting my fans with. I said I would like nothing more than to avenge my loss against Andre Ward and also to have the decider against Carl Froch. These are fights that motivate me, but for one reason or another, they do not want to fight me. I am always in training. It is part of my life, but I consider myself in a state of retirement. Finally, I would like to thank all of my fans for supporting me throughout my career. It has been an absolute pleasure stepping into the ring, home as well as abroad." Kessler (46-3, 35 KOs), who will turn 36 on March 1, turned pro in March 1998 and won his first 39 fights, including a seventh-round knockout of Puerto Rico's Manny Siaca in Denmark to win his first world title in November 2004. Kessler defended the belt four times, including going to former titleholder Anthony Mundine's turf in Australia for a clear decision win in his first defense. Kessler also defended the belt against former titleholders Eric Lucas and Markus Beyer as well as top contender Librado Andrade. Those victories set the stage for a much-anticipated, three-belt unification fight with fellow undefeated titleholder Joe Calzaghe, of Wales, to determine 168-pound supremacy. They met Nov. 3, 2007, in front of a crowd of more than 50,000 at Millennium Stadium in Cardiff in one of the biggest fights in division history, and Calzaghe, who was inducted into the International Boxing Hall of Fame in June, prevailed via unanimous decision to hand Kessler his first defeat. Kessler bounced back in his next bout to win another belt, stopping Dimitri Sartison in the 12th round to win a vacant belt. Kessler made two defenses before entering Showtime's high-profile Super Six World Boxing Classic, a six-man round-robin tournament involving six of the world's elite super middleweights. In his first bout of the Super Six, Kessler, who was the favorite to win the tournament, traveled to Ward's hometown of Oakland, California, and was manhandled in a one-sided 11th-round technical decision loss in November 2009. In his next bout of the tournament, in April 2010, Kessler returned home and won a rousing unanimous decision in an action-packed and competitive fight against Froch to claim another world title. Kessler never defended the title, dropping out of the tournament because of an eye injury. After a 14-month layoff, Kessler returned in June 2011. He won three fights in a row by knockout, including a third-round blowout of Brian Magee to win another title in December 2012. 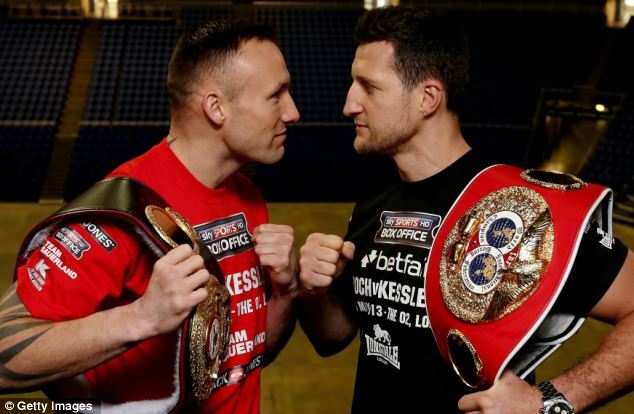 A rematch had been talked about since the first fight and they finally got together for the highly anticipated unification bout; England's Froch had won another belt after losing his to Kessler in their first fight. They met again in May 2013 before a sold-out crowd at the O2 Arena in London for one of the year's biggest fights, and Froch rolled to a unanimous decision. A year after that fight, Froch said at a news conference in Copenhagen that he planned to continue fighting, saying, "I've thought a lot about whether I should continue my career. I became a father and I have a life outside of boxing that I really appreciate. I've got a special responsibility. So it was not a decision I took lightly. But I still feel I have something to prove. I hate to lose. And I lost my last fight against Carl Froch. Many thought that I would quit, but I owe it to myself and my fans to finish on top. My last performance showed that I still belong at the top. And I know that my fans believe in me. "I've talked with my team, the people around me, and they are ready to support me on the journey to become world champion again. I still have a desire for boxing. I still love to train, and I believe that I can become a world champion again. Now that I've made the decision, it's all in. I'm ready for all the big names out there." Unable to get any of the big-name opponents he hoped to fight, however, Kessler decided to retire..